Typhoon FENGSHEN struck Metro Manila and passed toward north. While extended damage at many places has been reported, it was also reported that a ferry with passengers sank (capsized) off Sibuyan Island and more than 700 people are missing. Some people are rescued, if not many. According to a report, the ferry left Manila on Friday evening to Cebu Island, so the ferry was navigating toward the center of the typhoon as a result. Considering the intensity of the typhoon, this seems to be a reckless route. This typhoon was difficult to forecast - in spite of the initial forecast of turning toward north, this typhoon kept moving to west, and the track forecast moves more and more toward west. If this ferry kept its navigation without referring to the latest information, it might be encountered with a severe weather in the middle of the sea without enough time for evacuating into nearby available ports. Typhoon FENGSHEN still keeps moving toward west, and without turning to northward, it finally reached the west coast of Philippines after traversing islands. While it is moving over an area with many islands, it intensified further after entering into Visayan Sea, In a day or two, it may affect neighboring islands such as Panay and Mindoro Island, and especially the Manila metropolitan area that has large population. The latest information says 12 people were already killed. Typhoon FENGSHEN kept moving toward west-north-west, showing a track much closer to Philippines than the initial forecast of turning toward north. This typhoon has shown steady intensification since its birth, so islands that will be approached by the typhoon, namely Samar Island, Luzon Island (south), Catanduanes Island, will be affected by the typhoon. It seems that conditions for intensification is basically satisfied for this typhoon, but it is also possible that the land will give some impact on the intensification if the typhoon moves along the Philippine Islands. 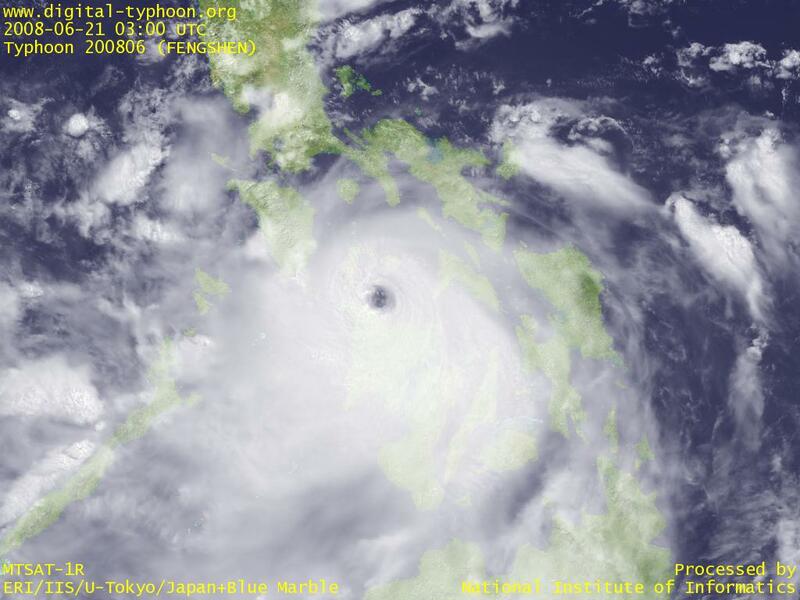 Typhoon FENGSHEN was formed in east of Mindanao Island. It will move northward off the east coast of Philippines, and will keep intensification for a while.